A New Dawn Realty aims to be your go to real estate agency in Stokesdale, offering you gorgeous houses for sale and top-notch real estate services in the greater Stokesdale area. Contact us today to learn more about our real estate services! Successfully selling your home has to do with a variety of different factors, including curb appeal. 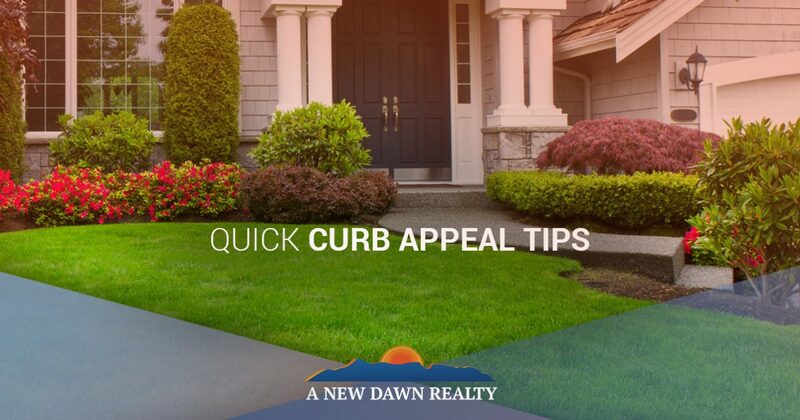 In this blog post, we’ll look at a few quick tips to help increase your home’s curb appeal. Whether it was when you took your first tour of it at an open house or after you moved in and made it your own, every home has something about its outdoor appearance that draws a person’s attention to it. Whether if it’s the unique front door, the fantastic siding and accents or another aspect, when it comes to curb appeal, you should think intently about what the strengths of your home’s appearance are and accentuate those things. If they played a role in you falling in love with it, with the right presentation, they’ll be able to do the same for your home’s next owner. Have you ever been looking for a home late at night, only to grow frustrated as you are unable to see its address numbers? As frustrating as that can be when you’re looking for the home of a friend or acquaintance, think about being an interested home buyer looking for a home, only to encounter this sort of frustration when looking for a home for sale. A great way to ensure that your home will avoid this sort of frustration is to make sure that your home’s address numbers are clear and easy to see. If it’s been a while since they’ve been upgraded, you can use this as an opportunity to replace them with bright new ones. Not only will it help ensure that your home will be easy to spot by interested buyers, little things like this will give potential buyer’s the peace of mind in knowing that the home they’re touring has been properly cared for. Whether you’re aware of it or not, the driveway to our home is actually symbolic. For you, it’s what invites you into your home after a long day of work, and for a potential home buyer, it’s very much the same, though it invites them to go further and see what the inside of the home has the offer. If your driveway is in need of touch ups, doing that will go a long way in terms of curb appeal. A clean and well kept driveway can be truly inviting for potential buyers, while a driveway that’s in desperate need of repair may do quite the opposite, discouraging buyers from going any further. Additionally, lining your driveway with greenery, flowers and other sorts of plant life will help add a sense of invitation to your driveway as well, though be sure to do so in a way that is tasteful and not overcrowded. There you go—just a few curb appeal tips for those of you looking to sell your home in Stokesdale. A New Dawn Realty is proud to provide you with the best homes for sale in Stokesdale. Whether you’re looking to sell your Stokesdale home or buy your first home in the area, A New Dawn Realty is here to provide you with the best real estate services in the area. Contact us today to set up an appointment with our Stokesdale real estate agency.